This remarkable true story begins in the Polish city of Krakow in 1890 and spans one hundred years and four continents. God blessed Lieba and the devout Jewish patriarch Daniel Baldinger with eleven children, and this richly textured portrait follows their lives down the decades, through the terrifying years of the Holocaust, to the present time. Lives that personify the struggles and hopes of their century. 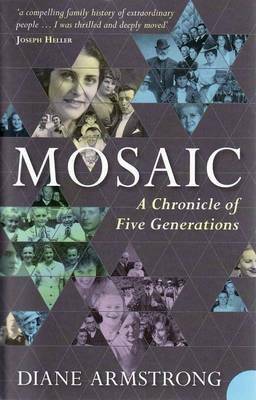 Mosaic is compelling storytelling at its best: from the fascinating detail of Polish-Jewish culture and the rivalries and dramas of family life, to its moving account of lives torn apart by war and persecution, this is an extraordinary story of a family, and of one woman's journey to reclaim her heritage. Diane Armstrong is a child Holocaust survivor who was born in Poland in 1939, and arrived in Australia in 1948. An award-winning journalist and bestselling author, she has written five previous books. 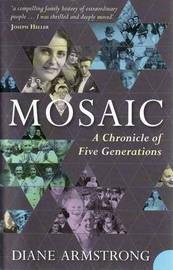 Her family memoir Mosaic, a Chronicle of Five Generations was published in 1998 and short-listed for the Victorian Premier's Literary Award for Non-Fiction as well as for the National Biography Award. It was published in the United States and Canada, and was selected as one of the year's best memoirs by Amazon.com. In 2000, The Voyage of Their Life, the Story of the SS Derna and its Passengers, was shortlisted in the NSW Premier's Literary Awards. Her first novel Winter Journey was published in 2004 and was shortlisted for the Commonwealth Writers' Literary Award. It has been published in the US, UK, Poland and Israel. Her second novel Nocturne was published in 2008 and won the Women Writers' Society Fiction Award. It was nominated for a major literary award in Poland. Empire Day, a novel set in post-war Sydney, was published in 2011. Diane lives in Sydney with her son, daughter and three granddaughters.